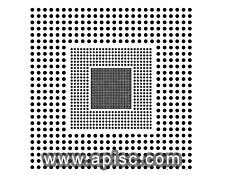 This target is designed to test resolution of electronic still picture cameras, and complies with ISO 12233. ISO12233. 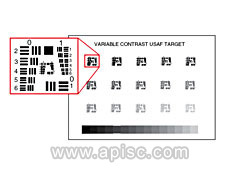 Both monochrome and color cameras delivering an analog or digital output can be used with this test chart. The target can be employed to measure visual resolution, limiting resolution, and offers a simple method in obtaining spatial frequency response (SFR) data, which is similar to that of MTF measurements for a camera. Features on the chart range from 100 to 2000 LW/PH (line widths per picture height), which corresponds to the finest feature being 0.1mm. 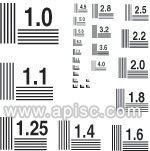 This test chart is offered in three sizes to accommodate a variety of cameras and lenses. The 1x and 2x Enhanced Digital Camera targets are based on the ISO-12223 chart but have additional information. 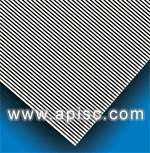 They can be used to determine reflective light resolution and imaging characteristics of digital still camera systems. N.I.S.T. Certificate of Accuracy Included 含N.I.S.T. Although distortion can often be troublesome in measurement applications, it is important to note that no information about the object is actually lost but merely misplaced in the image. 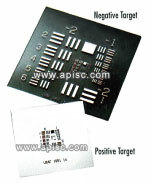 Using these targets, one can easily determine the precise amount of distortion present and back it out of measurements. The dot center can be located using blob (or centroid) analysis in measurement software. 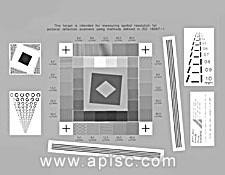 The grid pattern scales down so that one target can be used for a variety of lenses and fields of view.Included in the packaging is a serialized N.I.S.T. Traceable Certificate of Accuracy per MIL-STD-45662A. This unique target was developed to standardize an area of optical to lerancing that is most commonly determined theoretically. Our extensive experience in designing optical systems has shown that depth of field calculations can often yield very misleading results. This target solves the problem and very accurately determines the amount of shift an object can undertake before producing an unacceptable image. The definition of what constitutes an acceptable image is determined by the user and the application. The DOF 5-15 is made up of two sets of scales. 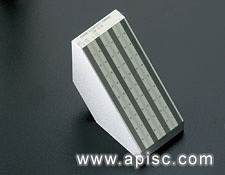 Each, when viewed at 45°, consists of horizontal and vertical lines at a frequency of 5 and 15 line pairs per mm. Instructions included. The IEEE target has been designed as a method of characterizing the amount of fine detail (resolution) that a camera system is able to reproduce from an original image.Since resolution can be different throughout the field of view both horizontal and vertical resolution can be measured in the center of the target as well as in all four corners. Additionally, the IEEE target can be used to check scanning linearity, aspect ratio, shading and interlacing.Ideal for comparing and standardizing multiple video systems and ensuring repeatability. Resolution test slides with the 1951 USAF test pattern are available in either positive (chrome pattern on clear background) or negative (clear pattern on a chrome background).The positive pattern is recommended for quality control of microscopes and magnifiers.The negative pattern is ideal for collimators and other illuminated test equipment. Each is boxed and includes resolution value chart. 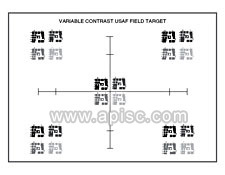 Targets conform to MIL-S-150A. 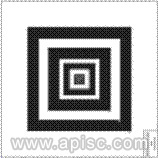 This 8.5" x 11" white photographic paper variable density target offers a convenient means of testing the gray level performance of optical systems. There are 15 density steps from a density of 0.09 to 1.5 on two progressions from high to low and low to high.This corresponds to optical density increments of 0.10. 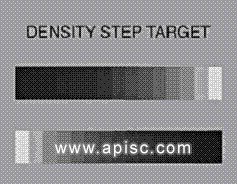 The variation between density steps is linear, which leads to a logarithmic change in diffuse reflectivity. Since a logarithmic reflectivity progression offers both finer and coarser incrementation than a comparable linear chart, it is often preferable for system testing. Paper is 0.2mm thick. White matte photographic paper. 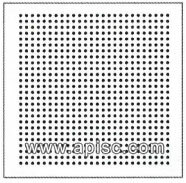 The Reflective Scanner Test Target is designed to measure the reflective light resolution and imaging characteristics of digital scanning systems, in compliance with ISO 16067-1 specifications. Target patterns include the Landolt Ring, alphanumeric resolution and slant edge charts, grey step patches, and horizontal, vertical, and slanted ronchi ruling patterns.